Custom Flooring Lake Mary, Florida. Order Custom flooring Now! Ability Wood Flooring is a specialty wood floor installation company. We are stationed in Orlando, Florida, and Custom Flooring Lake Mary and the surrounding areas. For more than 65 years, we’ve taken pride in sourcing the best floor coverings on the market and providing our local customers with easy access to a wide variety of floor surface materials at fair prices. Flooring is all we do. As a result, we can provide quick answers to your questions. In addition to off-the-shelf floor coverings, we also customize tiles, hardwoods, and more. This service is ideal for discerning customers who want to personalize the look of their home or business. Make a Confident Purchase – When you finally take our floor coverings home, there won’t be any surprises in terms of quality or functionality. We screen all flooring materials for value and excellence in hopes of eliminating any buyer’s remorse. Professional Installations – Don’t waste your hard-earned money hiring a subpar contractor. Preserve the quality of your new investment and come home to a solid and well laid out flooring underfoot with the help of our wood floor installation company in Lake Mary. Personalize the Look – We customize a variety of floor coverings, including tile, stone, engineered hardwood, and more. As an example, you can get a million-dollar look on a budget by customizing tiles to resemble hardwood with our wood-tile-lookalikes. All-In-One Services – With our flooring boutique, there’s no need to drive mindlessly around town searching for materials and a reputable contractor. Come to one place to find both flooring supplies and services. Buy a la carte or ask about a packaged deal including materials, customizations, and installations for one price. HardWood Flooring Orlando FL – Peek inside our flooring boutique for a wide selection of exotic wood flooring. These are available as either solid or engineered wood flooring. Tile – A practical and cost-efficient option, tile flooring is clean, classic, and simple to maintain. Customize the look to match your current design. Our customization services are readily accessible, and our turnarounds are super quick. Floor Restoration – In addition to supplying new flooring, Ability Wood Flooring also specializes in floor restoration services. Come and visit us to get cost comparisons between restorations and new floor coverings. Kitchen Flooring – Plan your kitchen design around gorgeous flooring that captivates every day of the year. Come and gather in our flooring boutique for design inspirations or to get a tangible feel of the floor coverings. 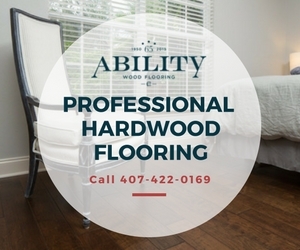 At Ability Wood Flooring, our goal is to help you enjoy your living space year-round – by finding a floor product that works for your home and needs. 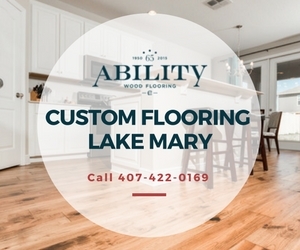 To learn more about custom flooring for Lake Mary, conact Us today! Wood Flooring Orlando FL – Peek inside our flooring boutique for a wide selection of exotic wood flooring. These are available as either solid or engineered wood flooring.